The instant pot has really opened up my cooking options. I don’t usually make a lot of boxed foods but I know some people need to so they can stretch the budget. I have used boxed mac n cheese many times when my kids were small. Now you can make it very easy right in the Instant Pot. I also have tried Boxed Instant Pot Hamburger Helper, Au Gratin Potatoes. 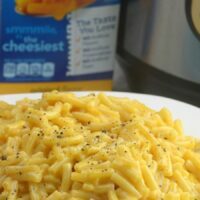 It is also simple to make homemade Mac n Cheese in the Instant Pot. 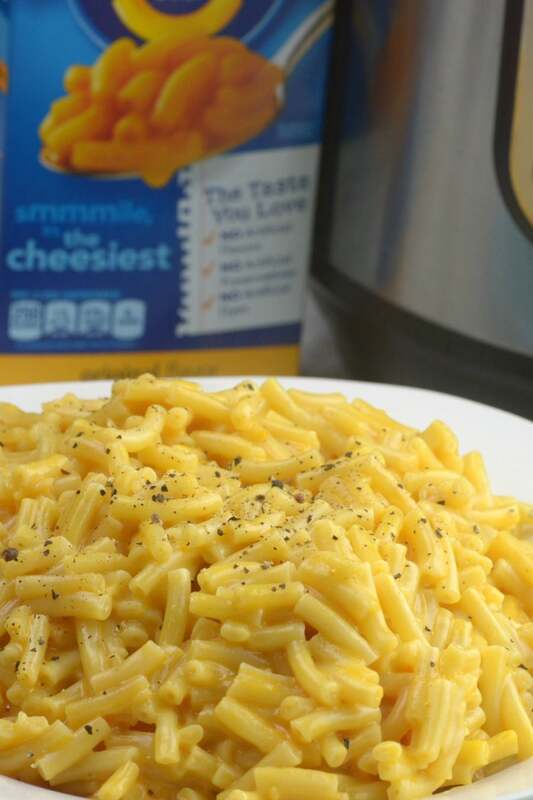 Here are the simple instructions on How To make Instant Pot Boxed Mac N Cheese. 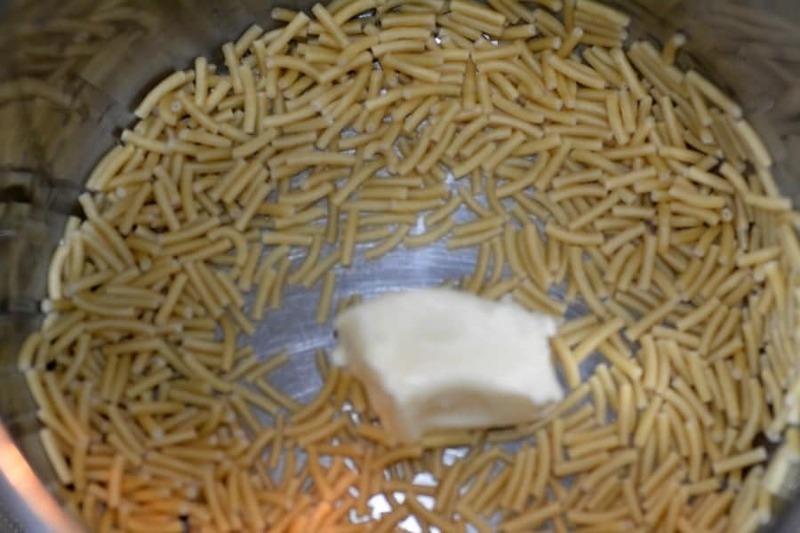 Pour pasta and 2 tbs butter into the pot. One Cup of Water. Place Pot on Manual High Pressure for 4 minutes. Do a quick release. Stir in 1/4 cup milk and cheese packet. Serve. Add butter, water, and pasta. Stir in milk and cheese packet. Any idea how much water for the family size box? 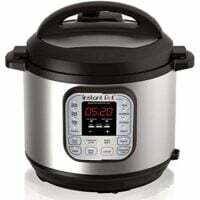 Hi there – I am fairly new owner of the Instant Pot and so far, it is amazing. I tried this recipe and found the pasta isn’t cooked as much as we like it to be. I wondered what you would suggest: Leave it it maybe for 5 minutes high pressure or would it be better to do the 4 min. but do a natural release for a couple minutes instead? Thanks in advance. Not sure what I did but most of the noodles burned onto pot. I put a cup of water. Do you cook it on high and sealed? your pressure cooker probably isn’t sealing very well and lost water to escaped steam. clean your gasket and pressure valves and the top rim of your pan, and or experiement with the amount of water. I used store brand (Kroger) 7.3 oz box in a 6 Qt Duo IP. Noodles were not done (still crunchy, not even al dente) at 4 min. Put lid back on, added 1/4 cup water, set to manual and 1 min +natural release, and they were perfect. So for next time I’m setting for 5 minutes, NPR, with 1-1/4 cup of water. Glad I read your review! 5 minutes with Natural release and 1.25 cups of water was right on! Thanks! Worked for me too. 1.25 cups of water, 5 minute cook time and wait 5 minutes to release pressure. Turned out perfect. Also works for the thick & creamy variety. I’m going to give this a try tonight instrumental of my usual instant pot Mac & cheese. Then I can teach my kids! I am doing a cooking project, and it is due tomorrow, do you know what type of butter to use? salted? or unsalted? My kids love hot dogs with the mac and cheese, would you add those after the mac and cheese is already done? can you put on warm for a bit to let the hot dogs cook a bit? Box Mac and cheese with hotdogs is one of my guilty pleasures, even at 30. I’ve always sliced them up, microwaved them for 30 seconds, and added them at the end with the cheese. Tastes great. do you have a steaming rack you can put above the mac n cheese? that would be a good way to heat the dogs. Would you add more time if you were making more than one box? i just made this. i expected to have to adjust everything, since i double boiler everything in the pressure cooker. i hate have to clean the big pot every time, so i use smaller metal containers inside the pressure cooker for the cooking. i put a half cup water in the big container, and a cup water with 2 table spoons of margarine, and set for 4 minutes. i went to water tv for a few minutes, and then remembered what i was doing. checked and it had finished a few minutes before. the pasta was not quite done, with some water still around it. i put the lid back on, waited 2 minutes and it was done. all stuck together. i wish i had immediately stirred it when there was still water. i added diced, cooked chicken breast. good recipe. Let Me Begin by saying this is the First time cooking mac and cheese in an instant pot. This recipe was straightforward enough, however, while following the recipe I experienced the noodles sticking very badly to the bottom of the instant pot and it was difficult to remove those noodles. I also used 4 minutes time on high pressure and as soon as the time was up I quick vented the pressure and the noodles did not come out Al Dente at all! Cooking macaroni and cheese and having Al Dente noodles is very crucial for me. Everything else about this recipe was just fine however I will reduce my time cooking the noodles and I will make sure that the butter is not who are in the middle of all the noodles without being melted first. I might even try using canola or olive oil. Basically worked, but not enough water and not enough time. Adding more milk and letting it absorb on keep warm made it a bit better. I’m thinking it’s because I’m at 6200 feet (didn’t remember to account for altitude.) Gonna try 20% more time and 20% more liquid…maybe five minutes and 2/3 cup of water and 1/3 cup milk. I’m not sure why, but I tried this and my macaroni was ruined. It was all stuck together and gummy. I followed the directions to a T. Scratching my head. Do you increase the water if you do 2 boxes at once? Earlier, the website couldn’t load on my smart phone (as I have used this recipe before, I came straight here), so I had to use another recipe that called for other timings! It was horrible and undercooked! 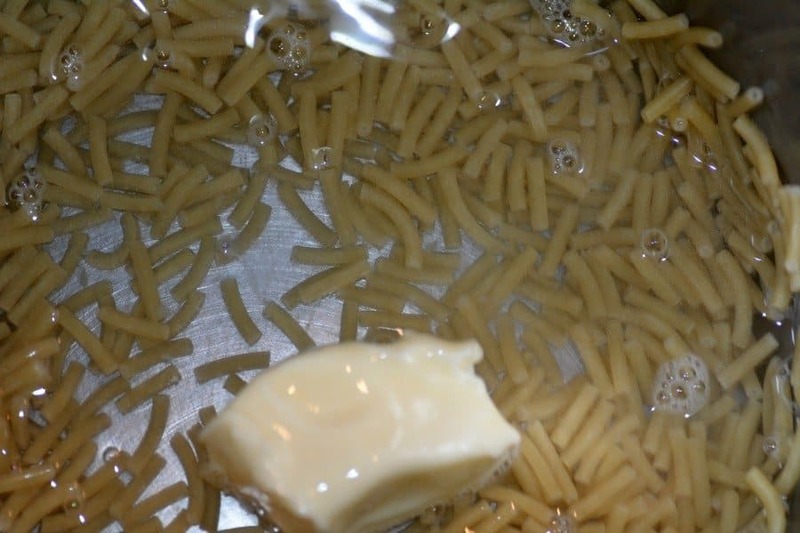 This is the only way to do Kraft Macaroni and Cheese the right way! Perfectly made macaroni and cheese from the box! Why only 2Tbls of butter when pkg calls for 4Tbls? I used your recipe last night everything came out great except for the flavor, it was very bland. Next time I’ll try adding the butter at the end with the milk and cheese maybe that will help the flavor, as you know “Everything tastes better with butter”. Can you make this with two boxes at the same time? ?